Courtesy Steam Cleaning is always available at Kiersten's Jewelry. A regular professional cleaning is a good idea. 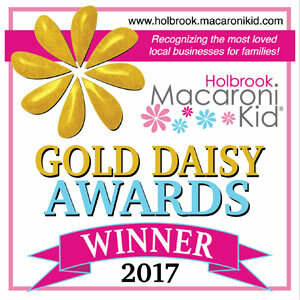 Not only does it keep your jewelry looking its best, it also ensures that a trained professional takes a look at it at least once a year, allowing for the earliest possible detection of wear or damage. Between professional cleanings, however, there are some things you can do to keep your jewelry clean. For diamonds, use a soft-bristled non-metallic brush and a mild soap and water solution. Gently scrub away any grime, especially around the prongs or setting where buildup is most likely. Even a clean looking diamond often has a thin layer of skin oil and will shine better after a cleaning. 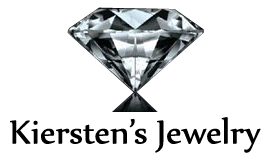 Avoid touching the diamond as much as possible. Keep in mind that some gemstones may have been treated or enhanced by heating, oiling, irradiation or diffusion. Heated and irradiated stones generally don’t require special care when cleaning, but diffused stones could become lighter if scrubbed too hard. 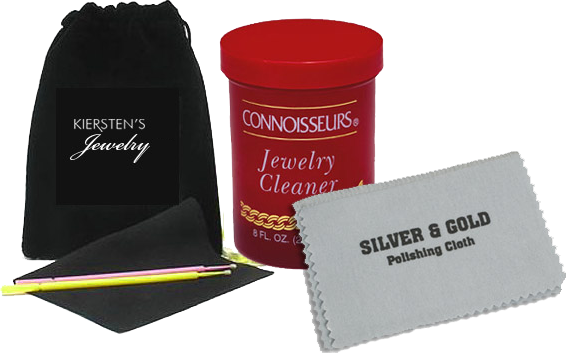 Simply bring it to your jeweler for a courtesy cleaning. Cleaning gemstones can be easy. Simply soak the piece in a bowl of warm, soapy water for several minutes and then use a soft, non-metallic brush to remove any grime. If you use a jewelry cleaner, make sure it is non-abrasive. Don’t use harsh chemical cleaners, and don’t clean the item after in the sink too often it ends up down the drain pipe. Be very careful with emeralds and opals. The oil on an emerald can be stripped away by cleaning, making the emerald change in appearance. It's always best to bring your fine jewelry and precious stones to your jeweler to ensure proper care. Pearls are beautiful and elegant. However, the layers of nacre of which a pearl is made of are very soft by jewelry standards and easily damaged. Since it is an organic compound, pearls also are easily dulled or even eaten away by chemicals and alcohol. Wash cultured pearls in very mild, soapy water and nothing else. It's also a good idea to bring your cultured pearls in for restringing every couple of years, especially if you wear them often. Ultrasonic cleaners are machines that clean jewelry by bombarding them with sound waves. This vibration shakes off dirt, but the vibrations can also cause serious damage. The inclusions in gemstones, especially brittle stones like emeralds, can be greatly enlarged by the shaking, making the stones less attractive and even less valuable. Soft gems like pearls and opals should never be put in an ultrasonic cleaner. Because of the risk, we recommend against using the ultrasonic cleaners now available to consumers unless your jeweler specifically says it won’t cause any damage.